Autograph album that was presented by a friend to Nannie E. Robinson at Christmas in 1860. The album was apparently later taken over by Nannie's niece Annie Lee Garner. The presentation page handwriting is very faint. 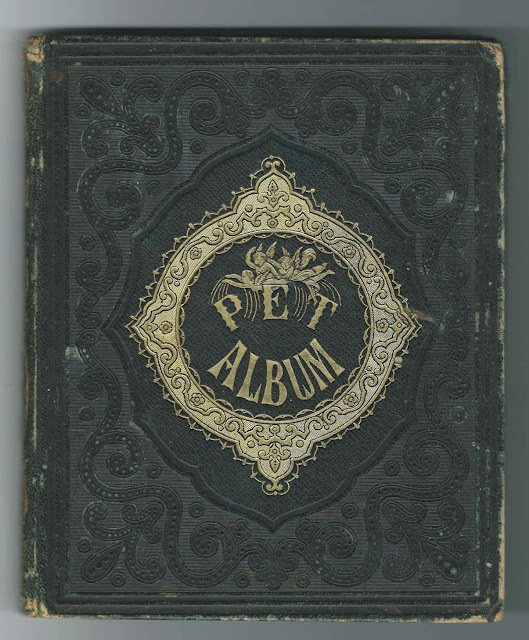 "This album was presented to Miss Nannie E. Robinson by a Friend on the 25th/December 1860". 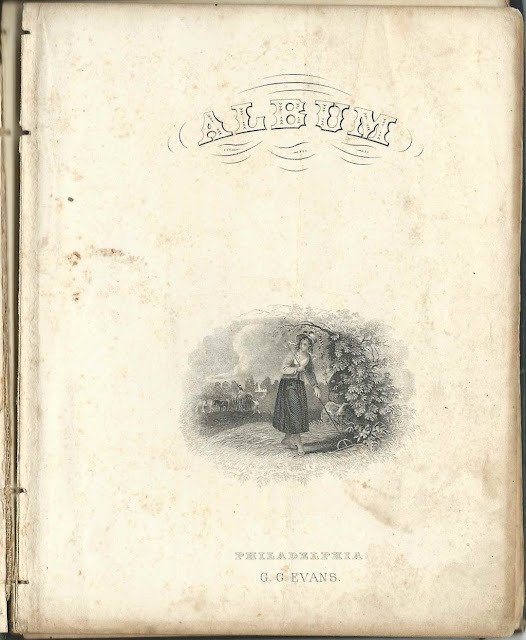 The album is approximately 7" x 5-1/2" and contains the sentiments of about a dozen relatives and friends of Nannie E. Robinson and her niece Annie Lee Garner. An alphabetical surname list and an alphabetical list of the signers, together with any personal information they offered, appear at the end of this post. 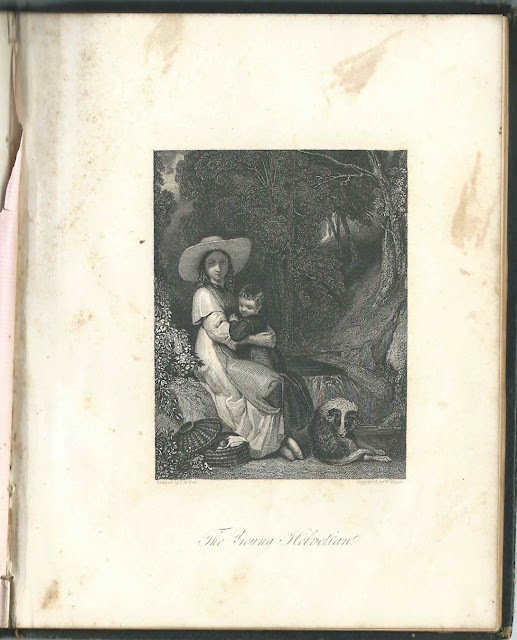 The album was printed in Philadelphia, Pennsylvania by G. G. Evans and contains three engravings, though there may have been more at one time. The frontispiece engraving is entitled "Our Pet", after the painting by H. Howard, R.A., and engraved by S. Davenport. The small engraving on the title page is not credited. Nannie E. Robinson was born August 13, 1845 at Tallapoosa, Georgia, the daughter of John and Gilliam Mary P. (Lavender) Robinson, who were born in North Carolina and Tennessee, respectively. On April 8, 1869 at Atlanta, Georgia, Nannie married Henry Clay Pendleton, son of Joseph Holmes Pendleton and Sarah M. (Hundley) Pendleton. Nannie and Henry eventually settled at Clarkston, Georgia; they had, possibly, 13 children. At some point between the 1860s and the late 1870s, the album apparently passed into the ownership of Nannie's niece Annie Lee Garner, born about 1867, daughter of Nannie's sister Susan Edelia (Robinson) Garner and her husband Thomas Samford Garner. 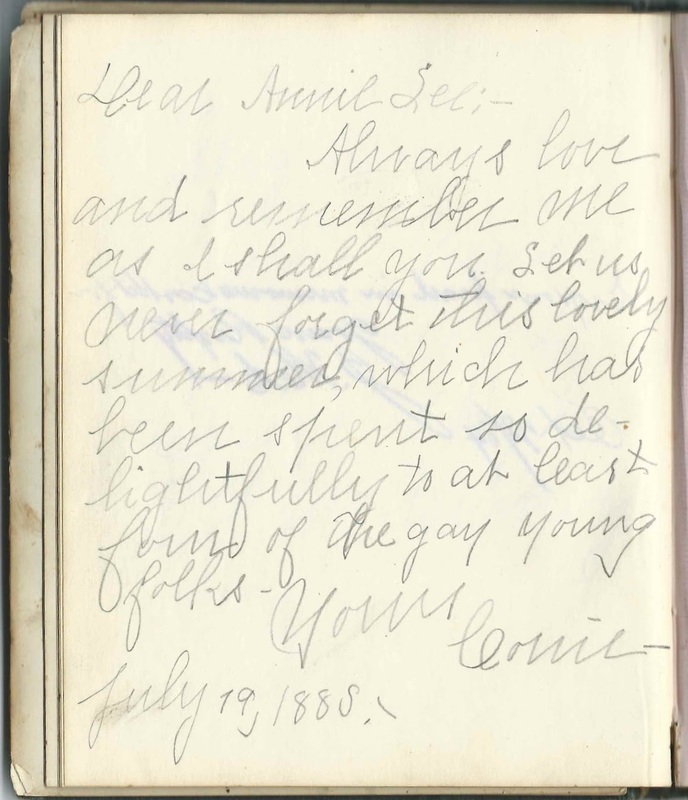 On February 1, 1888, Annie Lee Garner married John Thomas Anderson. Annie's sister Mary E. Garner signed a page. 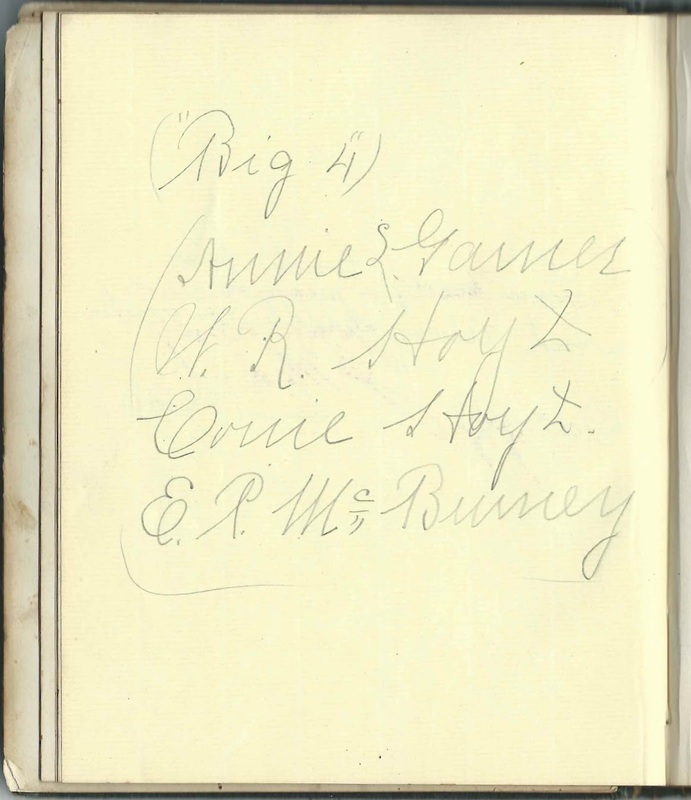 Annie is described as one of the "Big 4" on a page with herself, W. R. Hoyt, Cornie Hoyt and E. P. McBurney. I believe the Hoyts were brother and sister William Russell Hoyt and Cornelia Hoyt. 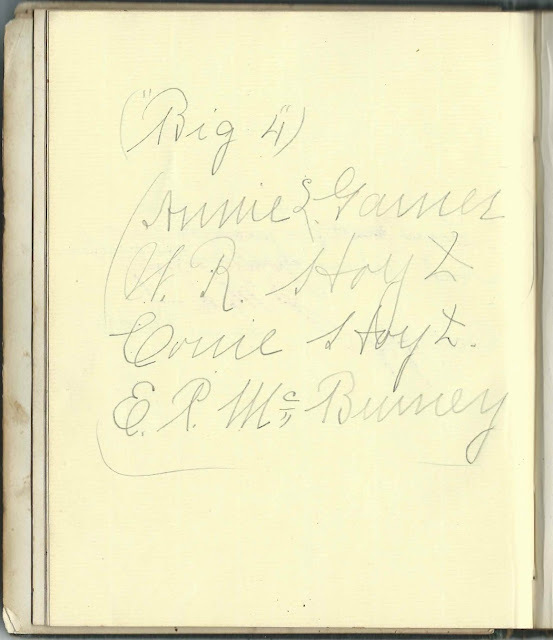 Cornie inscribed this page as the handwriting of her own page, signed on July 19, 1885, illustrates. Interestingly, signer Leonard Perry Pattillo, who inscribed his page on October 28, 1884, also married an Annie Lee, but I believe she was a different Annie Lee, perhaps Annie Lee Becker or Booker. Admirer, signed on September 9, 1882; inscribed to Lee, presumably Annie Lee Garner. 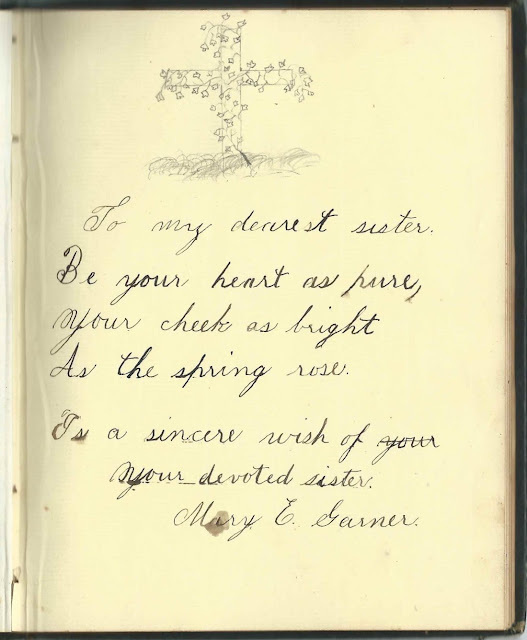 Maud Cater, signed on August 23, 1879; inscribed to Annie Lee Garner. Nellie Cater, signed on August 23, 1879; inscribed to Annie Lee. Mary E. Garner; called herself the album owner's sister. She was the sister of later owner Annie Lee Garner. They were the daughters of Thomas Samford Garner and Susan Edelia (Robinson) Garner, who was a sister to the original owner Nannie Elizabeth Robinson. Edith Horsey, signed on August 23, 1879; inscribed to Annie Lee. Leonard P. Pattillo, signed on October 28, 1884. Leonard Perry Pattillo married Annie Lee Becker or Booker on February 25, 1885.